Size of this preview: 800 × 548 pixels. Other resolutions: 320 × 219 pixels | 1,000 × 685 pixels. In many areas of the country local stones were used to build the drystone walls that still form the principal field boundaries in our upland areas often replacing hedges and fences. 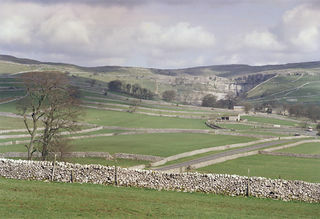 The Yorkshire Dales has many fine examples of drystone walling techniques. 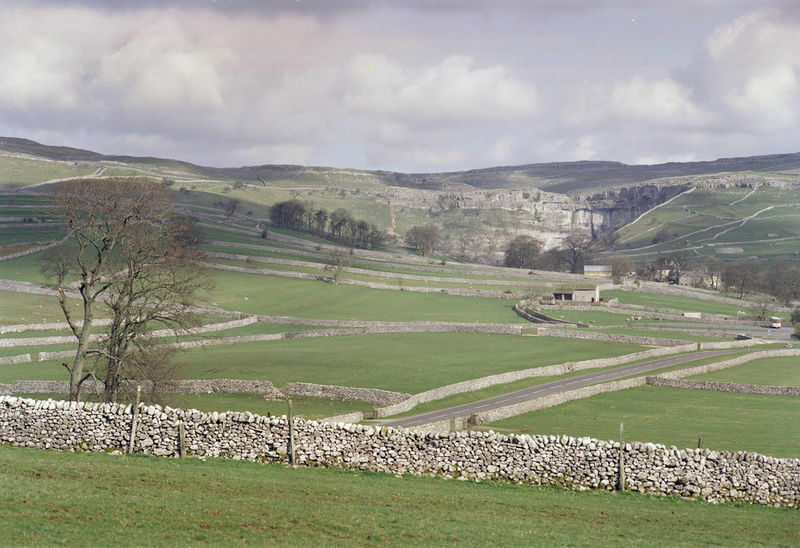 In this image the pale Carboniferous limestones have been used to create hundreds of kilometres of field walling. The term drystone refers to the fact that no cement or mortar was used in their construction. Typically a dry stone wall consists of an outer layer of large stones with an inner core of smaller stones. Drystone walling techniques, like the materials from which the walls are constructed, vary from area to area throughout the country. Often the different stone types available- thin-bedded, round boulders etc. - have necessitated the development of these different building techniques to produce a serviceable wall. However, the one consistent factor in their construction is that no mortar or cements are used.